Recent advances in generating active proteins through refolding of bacterial inclusion body proteins are summarized in conjunction with a short overview on inclusion body isolation and solubilization procedures. In particular, the pros and cons of well-established robust refolding techniques such as direct dilution as well as less common ones such as diafiltration or chromatographic processes including size exclusion chromatography, matrix- or affinity-based techniques and hydrophobic interaction chromatography are discussed. Moreover, the effect of physical variables (temperature and pressure) as well as the presence of buffer additives on the refolding process is elucidated. In particular, the impact of protein stabilizing or destabilizing low- and high-molecular weight additives as well as micellar and liposomal systems on protein refolding is illustrated. Also, techniques mimicking the principles encountered during in vivo folding such as processes based on natural and artificial chaperones and propeptide-assisted protein refolding are presented. Moreover, the special requirements for the generation of disulfide bonded proteins and the specific problems and solutions, which arise during process integration are discussed. Finally, the different strategies are examined regarding their applicability for large-scale production processes or high-throughput screening procedures. Recombinant DNA technology made available several simple techniques for transferring and efficiently expressing desired genes in a foreign cell. Thus, it was thought that unlimited and inexpensive sources of otherwise rare proteins would become accessible. It soon was observed that the host cell had a great influence on the quality and quantity of the produced recombinant protein. For example, recombinant protein production in mammalian cells yields a biologically active protein with all the required posttranslational modifications. However, mammalian cell cultivation is characterized by low volumetric yields of the recombinant protein, long cultivation times and requirements for expensive bioreactors and medium components. All these points have a great impact on the production costs. On the other hand, bacterial cultivation processes are based on inexpensive media in which fast growth and high cell concentrations can be obtained. These high cell concentrations combined with higher production rates of the bacterial expression system result in higher volumetric productivities. However, the production of recombinant proteins in bacteria such as Escherichia coli frequently yields an inactive protein, aggregated in the form of so-called inclusion bodies. Though, producing an inactive target protein in the form of inclusion bodies is an important drawback, it also has several advantages such as the high degree of purity of the target protein in the aggregate fraction and the increased protection from proteolytic degradation compared to the soluble counterpart. Inclusion bodies have long been considered completely inert towards in vivo dissolution; only recently it was shown that proteins can be resolubilized in vivo from inclusion body deposits . Although inclusion bodies in general consist of inactive proteins, E. coli can be the superior expression system compared to eukaryotic expression systems when the activity of the recombinant protein can be regained through refolding from the produced inclusion bodies. However, one needs to consider that the decision to select a specific expression system frequently is based on more trivial reasons such as staff knowledge and available equipment and facilities of the producing company/institute. A good example to demonstrate the diverse routes that can be used for recombinant protein production is the manufacturing of tissue-type plasminogen activator (tPA). This protein enables the dissolution of blood clots and is used therapeutically for the treatment of myocardial infarction, thrombosis, pulmonary embolism, and strokes. To assure sufficient tPA for such a widespread application, an economic production process is a necessity. From the beginning, both the mammalian as well as the microbial route were explored for the production of tPA . tPA is a fairly large (527 amino acids) monomeric protein containing 17 disulfide bridges. Because of this complexity, tPA was first produced in E. coli in the form of inclusion bodies while the mammalian expression system yielded an active protein that was secreted into the culture medium. More recently, obtaining active tPA through secretion into the periplasm of E. coli was attempted [3–5]. The early unsatisfactory yields have been improved [6, 7] rendering the E. coli secretion system as a future potential alternative route to generate functional tPA. Other recombinant organisms such as yeast , fungi  or insect cells  have not yet been considered as industrial producers for this protein. Initially, the recombinant tPA introduced into the market was obtained from genetically engineered mammalian cells . At that time, generating biologically active tPA from E. coli produced material was a process with a poor overall yield . Today, the majority of commercial tPA (alteplase, Activase®) is still produced using a mammalian expression system (Genentech: http://www.gene.com/gene/products/information/cardiovascular/activase/). In addition, an amino substituted tPA produced by the mammalian expression system with increased half-life (tenecteplase) was developed. Alternatively, a non-glycosylated, truncated tPA (reteplase, Retavase®) produced in E. coli in form of inclusion bodies and afterwards refolded to its biologically active form is now on the market (Centocor: http://www.retavase.com/) and apparently gains market share at the cost of the mammalian-derived product(s) (see Genentech 2004 First Quarter Report). Thus, continuous research effort focused on developing new refolding techniques or improving existing ones by including novel refolding aiding agents can make the bacterial inclusion body system an excellent alternative to the mammalian expression system or other expression systems that can directly generate active proteins with a complex disulfide bond structure. The foremost aim in improving protein refolding from E. coli produced inclusion bodies is to increase both the allowed protein concentrations during the refolding process and the final refolding yield. Recent advances in this area are summarized in conjunction with a short overview on inclusion body isolation and solubilization procedures. Moreover, the different techniques are discussed regarding their applicability for large-scale production processes or high-throughput screening procedures. A high degree of purification of the recombinant protein can be achieved by inclusion body isolation [for recent reviews on various aspects of inclusion body formation and renaturation of inclusion body proteins please refer also to [11–18]]. Inclusion bodies are in general recovered by low speed centrifugation of bacterial cells mechanically disrupted either by using ultrasonication for small, French press for medium, or high pressure homogenization for large scale. Main protein contaminants in the crude inclusion body fraction are proteins from the cell envelope, the outer membrane proteins . These proteins are not integral inclusion body contaminants but coprecipitate together with other insoluble cell material during inclusion body recovery. Lysozyme-EDTA treatment before cell homogenization facilitates cell disruption. Addition of detergents such as Triton X-100 and/or low concentrations of chaotropic compounds either prior to mechanical cell breakage or for washing crude inclusion body preparations allow the removal of membrane proteins or other nonspecifically adsorbed cell material [11–14]. After their isolation, inclusion bodies are commonly solubilized by high concentrations of chaotropic agents such as guanidinium hydrochloride or urea. Although expensive, guanidinium hydrochloride is in general preferred due to its superior chaotropic properties. Moreover, urea solutions may contain and spontaneously produce cyanate , which can carbamylate the amino groups of the protein . In addition, inclusion body solubilization by urea is pH dependent and optimum pH conditions must be determined for each protein . There are also reports that inclusion bodies can be solubilized at extreme pH in the presence or absence of low concentrations of denaturants [23–25]. However, extreme pH treatments can result in irreversible protein modifications such as deamidation and alkaline desulfuration of cysteine residues . Finally, inclusion bodies can be solubilized with different types of detergents [27, 28], low concentrations of denaturants [29, 30], or even by utilization of the aggregation suppressor arginine . Inclusion body proteins solubilized under these mild conditions can possess a native-like secondary structure [28–30], and may even reveal some biological activity [29, 31]. It has also been demonstrated that the utilization of milder solubilization conditions can lead to higher final refolding yields compared to solubilization by high concentrations of guanidinium hydrochloride or urea . In addition to the solubilizing agent, the presence of low molecular weight thiol reagents such as dithiothreitol (DTT) or 2-mercaptoethanol is generally required. These substances will reduce nonnative inter- and intramolecular disulfide bonds possibly formed by air oxidation during cell disruption and will also keep the cysteines in their reduced state [14, 15]. Optimum conditions for disruption of existing disulfide bonds are found at mild alkaline pH since the nucleophilic attack on the disulfide bond is carried out by the thiolate anion. Residual concentrations of reducing substances can negatively affect the refolding process, thus, they are frequently removed (e.g. by dialysis) before starting the refolding procedure. As an alternative, immobilized reducing agents (e.g. DTT; VectraPrime™, Biovectra) could simplify reducing agent removal by centrifugation after the solubilization process. Finally, the pH must be reduced before the removal of the reducing agent from the solution containing the solubilized protein to prevent the formation of undesired disulfide bonds. In general, the methods used for inclusion body solubilization result in a soluble protein that is devoid of its native conformation. This protein must then be transferred into conditions that allow the formation of the native structure (e.g. low denaturant concentration). Moreover, appropriate redox conditions have to be established when the protein contains disulfide bonds in the native state. When proper conditions for refolding are identified, the refolding process can require a few seconds or several days. During this period, the correct refolding pathway competes, often in disadvantage, with misfolding and aggregation of the target protein (Figure 1). 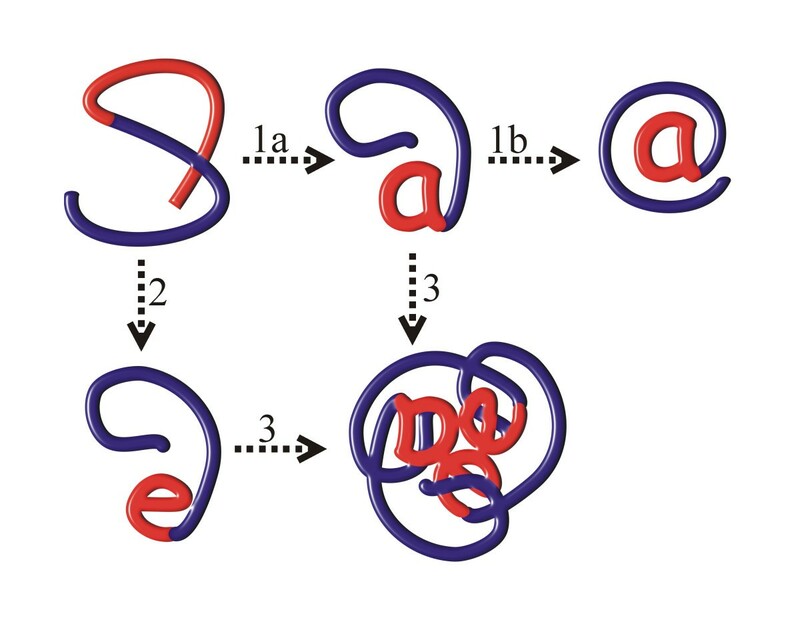 Protein refolding involves intramolecular interactions and follows first order kinetics [32–35]. Protein aggregation, however, involves intermolecular interactions and, thus, is a kinetic process of second or higher order, which is favored at high protein concentrations [32–35]. In fact, refolding yields commonly decrease with increasing initial concentrations of the unfolded protein independent of the refolding method applied [35–40]. Simplified model of correct folding versus misfolding and aggregation. The correct protein folding pathway (1) often competes with misfolding (2) and aggregation (3). Aggregation occurs among intermediates with exposed hydrophobic patches, which are buried in the correctly folded protein (blue lines, hydrophilic solvent-exposed parts of the protein; red lines: hydrophobic patches). Aggregates are formed by nonnative intermolecular hydrophobic interactions between protein folding intermediates, which have not yet buried their hydrophobic amino acid stretches (Figure 1). When the refolding process is beyond these aggregation-prone intermediates, the productive folding pathway is favored and aggregation does not occur. Therefore, prevention of hydrophobic intermolecular interaction during the first steps of refolding is crucial to allow successful renaturation at high protein concentrations. Only recently a non-empirical method for predicting the fate of proteins during the refolding process was proposed . It is based on the second viral coefficient, which indicates the magnitude of protein interaction under certain refolding conditions, and thus its tendency to aggregate. However, though being soluble in the refolding buffer is essential for a protein molecule to refold, it does not ensure that it will fold into the native form. Are further purification steps required after solubilization of inclusion bodies? The recombinant target protein represents in general the major fraction of the inclusion body proteins. Therefore, refolding attempts can be undertaken directly after solubilization of the inclusion bodies. Some reports, however, claim higher refolding yields when the solubilized inclusion body proteins are purified prior to the refolding attempt [36, 39, 42, 43]. Additional purification has been recommended when the protein of interest represents less than 2–5% of the total cell protein  or less than 2/3 of the total inclusion body protein . The type of contaminants can also be crucial for the success of the refolding process. For example, typical non-proteinaceous contaminants of inclusion body preparations did not affect refolding yields of lysozyme, while proteinaceous contaminants, which have a high tendency towards aggregation significantly reduced refolding yields . Further purification prior to the refolding attempt does not seem to be required, even at low target protein concentrations, when the solubilized inclusion body proteins are subjected to refolding conditions during size exclusion chromatography where refolding and purification can occur simultaneously . All pros and cons of any further purification step have to be carefully evaluated as they cause potential protein loss and additional production costs. The simplest refolding procedure is to dilute the concentrated protein-denaturant solution into a refolding buffer that allows the formation of the native structure of the protein. Most frequently, the final protein concentration after dilution is in the 1–10 μg/ml range in order to favor the productive refolding instead of the unproductive aggregation pathway. Though ideal at laboratory scale, this technique has serious drawbacks during scale-up as huge refolding vessels and additional cost-intensive concentration steps are required after renaturation. A major improvement of this technique was the development of a method where the solubilized, denatured protein is added in pulses or continuously into the refolding buffer [37, 40, 45–47]. This technique still keeps the simplicity of the direct dilution method while considerably increasing the final concentration of the refolded protein. Prerequisite is an appropriate knowledge of the folding kinetics of the target protein. The addition of the concentrated protein-denaturant solution should occur at rates slower than the rate-determining folding step of the target protein, thereby avoiding the accumulation of aggregation-prone folding intermediates [37, 46]. For pulse addition it has been recommended that 80% of the maximum refolding yield should be reached before adding the next pulse . Other factors to be considered are the increasing residual concentration of the denaturant with each pulse, which should not surpass concentrations that affect the refolding of the protein, and the amount of protein added per pulse, which should be optimized in batch experiments to minimize aggregation . Another technique to transfer the solubilized and unfolded protein to conditions allowing the formation of the native structure is the utilization of dialysis and diafiltration systems for denaturant removal [e.g. [48–51]]. In contrast to the direct dilution method, the change from denaturing to native buffer conditions occurs gradually. Thus, the protein passes through different regimes of denaturant concentrations, where folding intermediates that are prone to aggregation may become populated. Most often, these techniques cause more aggregation during refolding compared to the direct dilution method [e.g. ]. Additionally, refolding yields can be negatively affected by non-specific adsorption of protein to the membrane. However, for some proteins and with the appropriate denaturant removal rates, adapted to the requirements of the target protein, high refolding yields at high protein concentrations can be obtained [50–53]. A fairly simple device was recently introduced allowing continuous or pulse refolding in a similar way as in the direct dilution method . Buffer exchange for denaturant removal can also be carried out by using size exclusion chromatography (SEC). Most frequently, the denaturant-protein solution is injected into a column previously equilibrated with the refolding buffer [44, 55–58]. Subsequent elution with the refolding buffer results in a refolded protein in the eluate fraction with a considerably higher concentration compared to concentrations that can be reached by the simple dilution technique [44, 56, 58]. Protein refolding may be completed in the column or for proteins with slow folding kinetics the final folding steps may occur in the eluate fraction . Aggregate formation is supposed to be reduced either by physical separation of aggregation-prone folding intermediates in the porous structures of the gel  or, more likely, by resolubilization of formed aggregates through the delayed running front of the denaturant, which gives the solubilized aggregates another opportunity to refold . For proteins, which exhibit superior refolding yields during gradual denaturant removal, such as lysozyme, elution during SEC is preferably performed by using a decreasing denaturant gradient [38, 52, 59]. In specific cases, the denaturant removal can be accompanied with other changes in the buffer composition (i.e. pH) for further optimization of refolding conditions . An additional advantage of this chromatographic method is the concomitant purification of the target protein during the refolding process . Furthermore, some recent applications have shown the feasibility of using SEC for continuous processes of protein refolding [60, 61]. Also, SEC in combination with the use of an annular chromatography system can be coupled to an ultrafiltration and recycling unit for reinjection of resolubilized aggregates, which may form during the refolding process . Some parameters for refolding using SEC are of key importance. For example, protein aggregation during sample injection can cause low refolding yields ; injecting the sample followed by an additional small volume of denaturant solution solves this problem [44, 52, 62]. Also, optimum results can only be reached when the properties of the chromatographic resin allow efficient separation of the renatured target protein from different folding intermediates, misfolded protein, and aggregates that might form during the refolding process [59, 63, 64]. In general, lower refolding yields are obtained by injecting the denatured protein at high concentrations [38, 58, 60, 61, 64] and/or by elution at high rates [52, 62, 64]. Both conditions result in poor separation among different folding intermediates thereby boosting protein precipitation. Attaching the solubilized and unfolded protein to a solid support prior to changing from denaturing to native buffer conditions is another approach to avoid the unwanted intermolecular interaction between aggregation-prone folding intermediates. Binding of the solubilized and unfolded protein to the matrix requires the formation of a stable protein-matrix complex withstanding the presence of chaotropic agents. However, after changing to native buffer conditions, the detachment of the refolded target protein from the matrix should easily be accomplished. Several combinations of binding motives and matrices have been employed for binding the unfolded protein to the solid support. For example, proteins with a natural occurring charged patch in the unfolded chain, which binds to ion exchange resins [59, 65–67], or proteins containing artificially engineered peptide tags such as the hexahistidine tag, which binds to immobilized metal ions [59, 68–70], or N- or C-terminal hexaarginine tags binding to a polyanionic support , or protein fusions with denaturant-resistant binding domains, such as a glutathione S-transferase fragment, which binds to an anion exchange matrix  or the cellulose binding domain of the cellulose degrading multienzyme complex of the thermophilic bacterium Clostridium thermocellum, which binds to a cellulose matrix , have been employed. After binding, the matrix-protein complex is brought to refolding conditions by any of the above-mentioned techniques such as dilution , dialysis [68, 73], or buffer exchange through chromatography [59, 66, 69, 70, 72]. Finally, the refolded protein can be detached from the matrix, e.g. in the case hexahistidine-tagged proteins by elution with EDTA  or imidazole [59, 70] or by buffers with high ionic strength in the case of proteins bound by ionic interactions [59, 65, 66, 71, 72]. Due to the selective binding, matrix-assisted refolding can combine the renaturation of the target protein along with its purification from host cell protein contaminants [69, 70, 72]. Hydrophobic interaction chromatography (HIC) has also been successfully used for protein refolding with concomitant removal of contaminating proteins during the renaturation process [74–78]. Unfolded proteins are applied to the column at high salt concentrations and refolded and eluted with a decreasing salt gradient. In contrast to the above-mentioned chromatographic methods there is no requirement for typical refolding aiding agents such as arginine during the in-column refolding process. Moreover, refolding of the disulfide containing protein proinsulin was even obtained in the absence of a redox system in the mobile phase . It has been proposed that refolding is facilitated during HIC because unfolded proteins adsorb at high salt concentrations to the hydrophobic matrix and, thus, are not prone to aggregation. Additionally, hydrophobic regions of the protein that adsorb to the HIC matrix form microdomains around which native structure elements can form. During migration through the column, the protein will pass through several steps of adsorption and desorption, controlled by the salt concentration and hydrophobicity of the intermediate(s), resulting finally in the formation of the native structure . Apart from any of the above-mentioned techniques for protein refolding, there are physical and chemical variables that have a great impact on the final yield of biologically active protein. For example, temperature as well as the composition of the refolding buffer are important variables influencing the final refolding yield. The most important physical variable influencing the refolding yield is the temperature [40, 45, 50, 51]. Temperature has a dual effect on the refolding process. On one side, it influences the speed of folding and on the other it influences the propensity towards aggregation of folding intermediates with exposed hydrophobic patches. Also, there is limited temperature range in which each protein is thermodynamically stable in a given buffer system . In general, low temperatures support the productive folding pathway as hydrophobic aggregation is suppressed. However, low temperatures also slow down the folding rates, thus increasing the time required for renaturation . For refolding attempts of a new protein, 15°C has been proposed as a good starting point . Pressure was identified as another important physical variable affecting protein structure as well as protein refolding processes . It was shown that high pressure up to 3 kbar can disrupt oligomeric protein structures  and can dissolve protein aggregates and inclusion bodies [81, 82]. The disassembled protein monomers retain native-like secondary structure up to 5 kbar . After gradual depressurization, they can reach their native state even at high protein concentrations, because folding intermediates prone to aggregate at atmospheric pressure are prevented from aggregation by high pressure [81–83]. Certainly, L-arginine is nowadays the most commonly used refolding aiding agent . It impedes aggregate formation by enhancing the solubility of folding intermediates, presumably by shielding hydrophobic regions of partially folded chains. In addition, it has been shown that numerous other low molecular weight additives such as detergents, protein-stabilizing agents such as glycerol or even low residual concentrations of denaturants improve refolding yields by suppressing aggregation . In addition, high-molecular weight additives such as polyethylene glycol were used successfully for enhancing protein refolding yields . More recently, low-molecular weight non-detergent zwitterionic agents such as sulfobetaines, substituted pyridines and pyrroles and acid substituted aminocyclohexanes have been employed successfully for protein renaturation [40, 85–87]. Moreover, polymers with temperature-dependent hydrophobicity were effectively applied for protein refolding at higher temperatures [88, 89]. The benefit of each of these refolding aiding agents for a given renaturation system has to be elucidated experimentally, as they are not equally advantageous for all proteins. The mechanisms of interactions of these refolding aiding agents with the folding intermediates remain often obscure although it is clear that all these substances suppress aggregation in favor of the productive folding pathway . Detergents [91, 92] and phospholipids [93, 94], in the form of micelles and liposomes , respectively, as well as mixed micelle systems formed by phospholipids and detergents [92, 95, 96] have shown potential to aid protein refolding. Most likely, illegitimate hydrophobic interactions between folding intermediates are suppressed by transient nonpolar interactions between the protein and the micelle or liposome [91–93]. Additional transient polar interactions in mixed micelles are supposed to be responsible for higher refolding yields compared to only detergent-based micelle systems [92, 96]. Moreover, liposomes linked covalently to chromatographic resins have potential to combine renaturation and separation of the refolded target protein [93, 94]. Reversed micelles, formed when an aqueous detergent solution is mixed with an organic solvent, can also facilitate protein refolding by avoiding aggregate formation . The denatured protein, once transferred to this solution, tries to avoid the organic phase, and, after reaching the hydrophilic core of the reversed micelle, can refold as a single molecule . Recently, it was demonstrated that protein precipitates can be solubilized by direct addition into the reversed micellar system allowing refolding with high yields at high protein concentrations [98–100]. Yet, direct solubilization of inclusion bodies in reversed micellar systems has not been reported. In addition, recovery of refolded protein from these micellar structures is not easily accomplished [97, 99]. Chaperones are a group of proteins conserved in all kingdoms, which play a key role in assisting in vivo protein folding and protecting cellular proteins from different types of environmental stress by suppressing protein aggregation. For example, the major E. coli chaperonin GroEL is involved in the in vivo folding of 10% of all newly synthesized proteins at normal growing conditions, and of 30% under stress conditions . GroEL assists protein folding by a first capturing step of aggregation-prone folding intermediates . The release of the folding-competent form is then accomplished in an ATP-dependent fashion through the action of the cochaperonin GroES . Natural chaperones have also been applied successfully to refold various proteins in vitro . However, their routine application is limited by their cost, the relatively high chaperone concentration required (at least equimolar to the target protein) and the need for their removal after the refolding procedure [103, 104]. Some procedures have tried to overcome these limitations by utilizing immobilized and reusable (mini)-chaperone systems [104–106]. Nevertheless, chaperone-based refolding processes are not robust enough for large-scale processes . A further development of the detergent-based micellar system mimics the two-step mechanism of chaperone-assisted protein folding. The capturing step is performed by diluting the denatured protein into a detergent solution, which prevents protein aggregation through the formation of mixed protein-detergent micelles [107–110]. Aqueous solutions of hydrogel nanoparticles (e.g. self-assembly of hydrophobized polysaccharides such as cholesterol-bearing pullulan) have been also used for the capturing step . The release of the folding-competent protein is subsequently initiated by the addition of cyclodextrins [107–112]. They are added in excess to the capturing agent and strip the detergent from the protein-detergent micelles through the formation of a tight detergent-cyclodextrin complex. Long cyclodextrin polymers as striping agent were reported to result in higher refolding yields compared to monomeric cyclodextrins . Also, rapid addition of soluble cyclodextrins is thought to result in higher refolding yields compared to slow addition [108, 109] or the utilization of immobilized cyclodextrins [108, 109]. However, at least for α-glucosidase similar refolding yields were reported by stripping the detergent either with soluble or immobilized cyclodextrins . The utilization of these cyclodextrin polymer beads allows simple removal of the cyclodextrin-detergent complex by centrifugation and, moreover, these beads can be used in expanded-bed columns in semicontinuous refolding processes . In vivo, many proteins are transported through bilayered membranes in an extended and partially unfolded form either simultaneously or after their synthesis . A rather peculiar protein refolding procedure mimicking the effect of a bilayered membrane was carried out in a three-phase liquid system built up in a centrifugation tube . The upper phase contained an organic solution, which was separated from the aqueous refolding buffer by liquid paraffin. The protein, in an aggregated and denatured form, was added to the organic phase and forced to pass through the paraffin film into the refolding buffer by centrifugation. This procedure was successfully applied for the refolding of aggregated and denatured preparations of the model proteins RNase A and BSA. Several proteins are synthesized in their natural environment with amino-terminal propeptides usually located between a signal sequence and the mature part of the protein. In vivo, these propeptides are known to play a key role in assisting the correct folding of the mature part of the protein . In vitro studies have demonstrated that they can facilitate the refolding in cis, when the denatured mature protein is still linked to its propeptide prior to the transfer into the refolding buffer, or in trans by including the isolated propeptide into the refolding buffer [118–120]. This propeptide assisted protein refolding can be exploited for the renaturation of inclusion body proteins either by synthesizing the mature part linked to its propeptide, thus allowing later facilitated refolding [121, 122], or by synthesizing the mature protein and then including the appropriate propeptide into the refolding buffer . Another method of template-assisted protein refolding exploits the specific binding properties of monoclonal antibodies to the target protein to reduce the time required for protein refolding and to enhance the final refolding yield [124, 125]. This procedure does not work with all antibodies and depends on the availability of specific antibody clones. Thus, it represents more a proof-of-principle rather than a practical approach to generate active proteins through refolding of inclusion body proteins. In general, solubilization of inclusion body proteins by chaotropic agents is carried out in the presence of reducing agents such as dithiothreitol or β-mercaptoethanol to allow the disruption of nonnative disulfide bonds. Following solubilization, naturally disulfide-bonded proteins have to be refolded under conditions, which permit the formation of their native disulfide bonds. In the simplest way, free cysteine residues can be oxidized by molecular oxygen, a redox reaction catalyzed by Cu2+ ions [126, 127]. Though a cheap option, air oxidation is slow, often results in mismatched disulfides, and is not suitable for disulfide-bonded proteins, which also have free cysteines . Disulfide bonds are more efficiently formed when a mixture of low molecular weight thiols (e.g. glutathione) in their reduced and oxidized state is added to the refolding buffer [126, 128]. Best conditions for refolding of disulfide-bonded proteins are commonly established when the reduced form is present in excess and the pH is slightly alkaline. These conditions allow rapid disulfide exchange reactions until the protein reaches the most stable disulfide-bonded configuration, in general the native state of the protein [26, 126, 128–130]. Recently, a novel generation of aromatic thiols was developed which have lower pKa values as the aliphatic thiols thus enabling disulfide-bond formation at lower pH values [131, 132]. These thiol reagents might be useful for the refolding of proteins with limited stability at alkaline conditions. Also, an immobilized disulfide-reshuffling system based on thiol-carrying latex particles has recently been successfully applied for the refolding of RNase A [133, 134]. Naturally disulfide-bonded proteins in their reduced states are often very unstable and exhibit a high tendency towards aggregation, especially during the early stages of refolding . These problems can be overcome by modifying the reduced thiol groups in the unfolded protein, either by S-sulfonation [39, 128, 135, 136] or by transforming the free cysteines into mixed disulfides with the oxidized form of a thiol reagent (e.g. glutathione) [128, 137]. These chemical modifications introduce numerous charged residues into the protein, which prevent the intermolecular interactions responsible for aggregation. The chemically modified protein is then transferred to refolding conditions. Correct disulfide bond formation for S-sulfonated proteins is initiated by supplementing the refolding buffer with the appropriate redox system [39, 128, 135, 136], or, for proteins with mixed disulfides by adding trace amounts of the reduced form of the thiol reagent [128, 137]. Improvements of refolding yields of disulfide-bonded proteins have also been achieved by using protein disulfide isomerase (PDI) in combination with a redox system. PDI is a folding catalyst that assists disulfide bond formation in vivo  and was successfully implemented for aiding disulfide bond formation during in vitro protein refolding [139, 140]. In some cases PDI did not show significant effects on the refolding yield but significantly increased the refolding rate . However, residual concentrations of chaotropic agents in the refolding buffer, especially guanidinium hydrochloride, can drastically reduce PDI activity . Traces of small peptides containing the active site of PDI  and chemically synthesized dithiol molecules mimicking PDI function [144–146] have also shown potential to increase the in vitro refolding yields generally obtained with the common redox systems [143, 146]. Published refolding processes are often composed of numerous and cumbersome steps, both downstream (e.g. cell disruption, inclusion body isolation and purification by several centrifugation and washing steps followed by a final solubilization procedure) and upstream of the renaturation process (e.g. removal of aggregates and misfolded protein and final purification of the correctly refolded target protein). Scale-up problems can arise when some of these steps are not transferable to larger scale processes. As an alternative to the common downstream process, inclusion bodies can directly be solubilized from chemically treated E. coli cells [147–150] or in combination with mechanical treatments . Even more, inclusion body solubilization directly from cells in the cultivation broth is feasible as was shown for periplasmic  as well as for cytoplasmic inclusion bodies . A high degree of purification, removal of cell debris and E. coli host cell proteins, can be achieved by selective extraction of inclusion body proteins combined with diafiltration , aqueous two-phase extraction  or selective capture by either expanded bed chromatography [72, 149, 151] or by attachment to magnetic particles recoverable in high gradient magnetic fields . Major difficulties often arise by the increase of broth viscosity due to release of DNA after chemical treatment requiring its selective removal e.g. by precipitation through spermidine addition [149, 151] or preferably by treatment with DNA-degrading enzymes . Afterwards, the prepurified and solubilized target protein can be subjected to refolding conditions using any of the above-mentioned methods. Moreover, there are reports on integrated processes where solubilization of the target protein from chemically treated cells is followed by a chromatographic process in which the capturing step and removal of E. coli contaminants is followed directly and in the same operation unit by refolding and subsequent purification [72, 74]. Utilization of refolding methods based on chromatographic processes is additionally advantageous as they combine refolding with an at least partial purification of the target protein [44, 69–72]. In addition, aggregates formed during the refolding process can also be removed through chromatographic processes as they have a different retention time compared to the correctly folded protein [56, 64, 67]. Finally, chromatographic processes can be performed continuously [60, 61] with the possibility to recycle aggregates formed during the refolding process thus leading to processes with refolding yields up to 100% . After the first enthusiasm about protein production using recombinant microorganisms, it was promptly understood that obtaining an active form of the desired protein was not a simple task. Many proteins form nonnative precipitates in form of inclusion bodies when synthesized in bacteria and there is no universal refolding recipe for the generation of native protein from solubilized inclusion bodies. For any given protein, the best refolding conditions still have to be determined empirically. Among a lot of experience and "a good feeling for the best way", the use of experimental design methodologies [154, 155] and further improvements in predicting the likelihood of aggregation [41, 156] may increase the speed for finding the optimal refolding conditions for a given protein. Also, less-established and new techniques as well as new refolding aiding additives may become more widely used in the near future. However, these techniques or new protein refolding aiding substances await rigorous testing for refolding of not only easy-going model proteins such as RNase A but also for more recalcitrant inclusion body proteins. Moreover, refolding strategies also have to be adapted to the required quantity and final use of the refolded protein. For therapeutic proteins needed in great quantities more effort can be undertaken to identify the best refolding conditions leading to high yields of the correctly folded protein. For a protein where just a few milligrams are required for biochemical and/or structural studies process optimization with respect to high yields is not such a necessity. Also, special demands for high throughput refolding screening arising from structural genomic projects require robust strategies that will lead to monodisperse refolded protein samples . In this case, the direct dilution method in combination with variations in temperature and buffer composition is still the best approach. Altogether, new strategies need to increase the robustness of refolding processes and/or decrease the costs to find acceptance for broader applications. This study was carried out in the context of a grant of the Deutsche Forschungsgemeinschaft (SFB 578 "Vom Gen zum Produkt", Project B1).